Visit MyHousing Self-Service to complete the Fall 2019 Biola Housing Application (available February 1 to May 5 for highest priority placement, and May 6 to September 4 for late placement)! Please remember: Students younger than 20 years old by 9/4/19 are required to live on campus unless living at their guardians/parents home (called the Residency Requirement). If you are under 18 years old at the time you complete the Biola Housing Application, your parent/guardian must complete the Housing Contract 2019–2020 then email it to undergrad.housing@biola.edu, or mail it to Biola University Attn: Housing, 13800 Biola Ave., La Mirada, CA 90639. If you are ready to apply for Biola Housing, pay the $250 Housing Deposit by credit card on MyAccountTouchnet or in person at the Cashier's Office (lower level Metzger Hall). 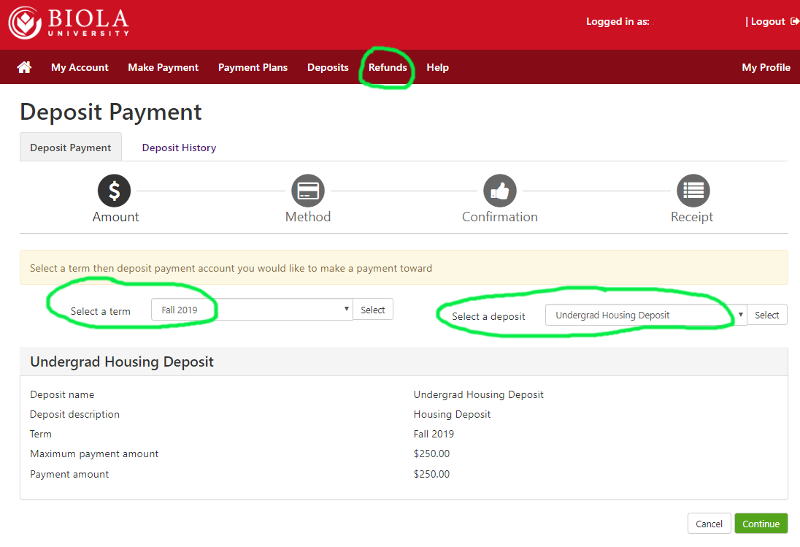 Once the deposit has been paid, login to MyHousing & Dining Self-Service to complete the Biola Housing Application. If you were younger than 18 years old at the time you applied, download the 2019–2020 Housing Contract, have your parent/guardian sign it. You may email it to undergrad.housing@biola.edu, or mail it to Biola University, Attn: Housing, 13800 Biola Ave., La Mirada, CA 90639. If you are under age 20 and would like to commute from your parents'/guardians' home or if you are an Incoming Student over age 20 and want to commute from your parents'/guardian's home or non-Biola Housing, please complete the Intent to Commute Form on MyHousing & Dining Self-Service (available February 1 to May 1, late fall admits can complete it after May 1).